The paper presents the MULTEXT-East language resources, a multilingual dataset for language engineering research, focused on the morphosyntactic level of linguistic description. The MULTEXT-East dataset includes the morphosyntactic specifications, morphosyntactic lexica, and a parallel corpus, the novel “1984” by George Orwell, which is sentence aligned and contains hand-validated morphosyntactic descriptions and lemmas. The resources are uniformly encoded in XML, using the Text Encoding Initiative Guidelines, TEI P5, and cover 16 languages, mainly from Central and Eastern Europe: Bulgarian, Croatian, Czech, English, Estonian, Hungarian, Macedonian, Persian, Polish, Resian, Romanian, Russian, Serbian, Slovak, Slovene, and Ukrainian. This dataset, unique in terms of languages covered and the wealth of encoding, is extensively documented, and freely available for research purposes. The paper overviews the MULTEXT-East resources by type and language and gives some conclusions and directions for further work. The author would like to thank Radovan Garabik, Natalia Kotsyba, Katerina Zdravkova, and Darja Fišer for their helpful comments and suggestions. Work on the MULTEXT-East resources was initially supported by the EU project MULTEXT-East “Multilingual Text Tools and Corpora for Central and Eastern European Languages”, the US NSF grant IRI-9413451 and the EU Concerted Action TELRI “Trans-European Language Resources Infrastructure”. Work on the second release was supported by the EU Project CONCEDE “Consortium for Central European Dictionary Encoding”, while the work on the third release was partially funded by a the NEH grant to the TEI Task Force “SGML–XML migration”. Work on the fourth release was supported by the EU project MONDILEX “Conceptual Modeling of Networking of Centres for High-Quality Research in Slavic Lexicography and their Digital Resources”. The work on the resources has been additionally supported by bi-lateral projects between Slovenia and Serbia, Slovenia and Macedonia, as well as individual partners’ grants and contracts. EAGLES. (1996). 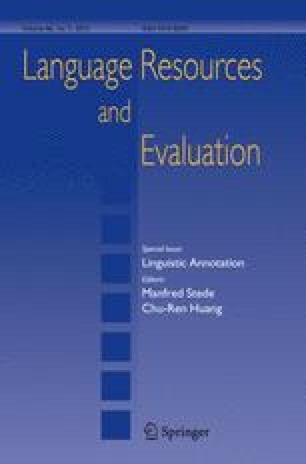 Expert advisory group on language engineering standards. http://www.ilc.pi.cnr.it/EAGLES/home.html. Krek, S., Stabej, M., Gorjanc, V., Erjavec, T., Romih, M., & Holozan, P. (1998) FIDA: A corpus of the Slovene language. http://www.fida.net/. TEI Consortium. (2007). TEI P5: Guidelines for electronic text encoding and interchange. TEI Consortium, URL: http://www.tei-c.org/Guidelines/P5/.